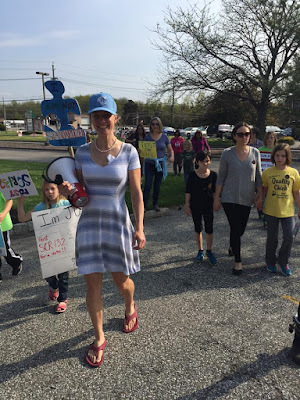 Yesterday I went on a road trip with my twin 10 year old girls to Senate President Steve Sweeney's office where we spent time with some of the most fantastic, courageous folks you'd ever want to meet. 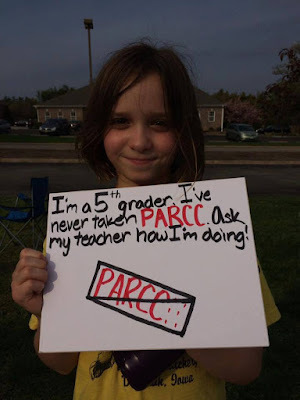 To ask Senator Sweeney to post SCR 132, a concurrent resolution that would send NJ's new PARCC graduation requirement regulations back to the State Board of Education for a much needed re-write. You see, the regulations that the State Board passed don't match up with state statute. The statute calls for a test of basic skills administered in 11th grade with re-testing options in grade 12. So what does the NJDOE and the State Board do? 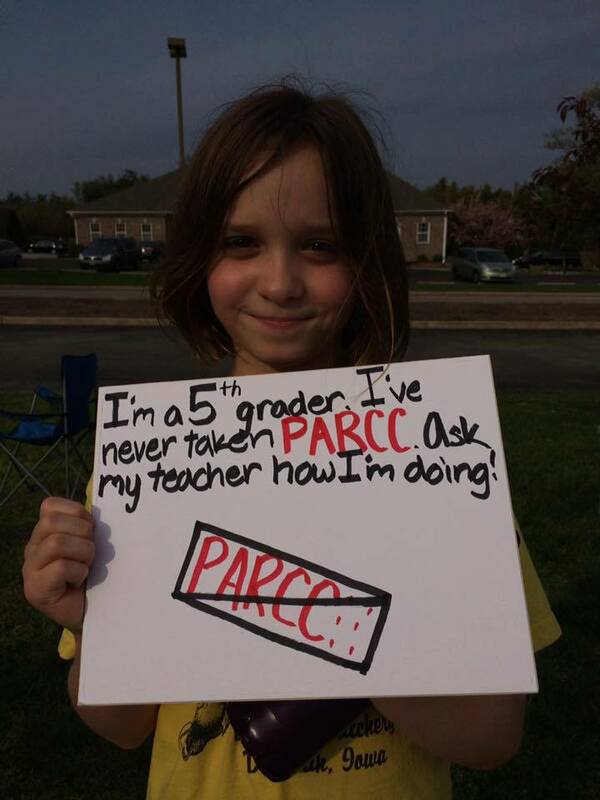 Propose and pass regulations that make PARCC Algebra 1 (taken as early as 7th grade) and PARCC ELA 10 the new exit exams. And the best part about the concurrent resolution? It completely side-steps Christie. It's veto proof. The Assembly already passed their version of the resolution. If it passes the Senate the regulations go straight back to the State BOE for revision. But Ruiz hasn't posted it in the Senate Education Committee, and Sweeney hasn't posted it for a vote - it's completely stalled. The New Jersey Senate, ladies and gentlemen - where pro-public education bills go to die. But grassroots activists don't give up and we don't give in, so we headed for Sweeney's West Deptford office to bring our message right to his door. 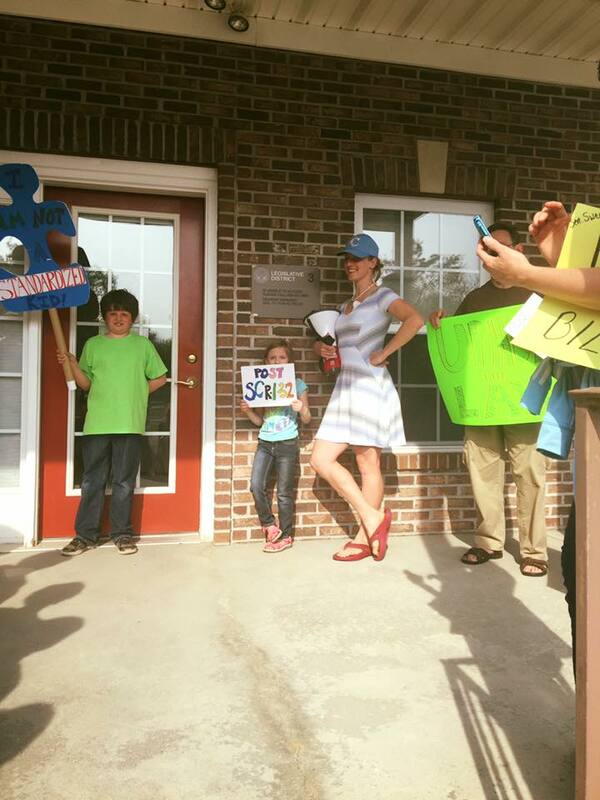 We rallied for a bit across the street, and then we strolled over to Sweeney's office and chatted with his staff. Let's go see Sweeney - with a bullhorn! and see what happens - with a bullhorn. This is just what Sen. Sweeney's staffers wanted to see at 4:45. That's (one of) my girl(s). 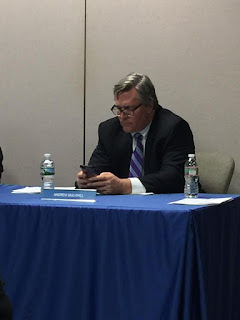 State Senate President Stephen Sweeney and Sen. Teresa Ruiz, chair of the chamber's Education Committee, penned a letter to state education officials this week, indicating that the use of PARCC as a high school exit exam violates legislative intent. If you'd like to read the letter, you can find it here. But why did Sweeney and Ruiz send a letter? Why didn't they just post SCR 132, and allow the full Senate to vote? The letter is addressed to State BOE President Mark Biedron and Acting Commissioner Kimberly Harrington. Governor Chris Christie and Assembly Speaker Vincent Prieto are copied on the letter. Was a deal struck to do this more quietly to avoid humiliating the Governor - a man who is already the least popular Governor in the nation? It's anybody's guess what will ultimately become of the graduation requirement regulations, but I'm putting this one in the win column for now. There's a lot more work to be done, but this is a damn good start. And best of all, when my girls came home from school and I told them the news, one exclaimed with glee, "We made a difference!" Yes my darling girl, we made a difference. On the heels of an explosive investigation of Gulen Charter Schools in New Jersey by The Record, comes a report today from CBS claiming that teachers at Gulen charters were forced to turn over up to 40% of their salary to the Gulen movement. Leaving aside the insanely complex political issues for the moment, I'd like to add to the phenomenal job The Record has done investigating New Jersey's Gulen charters. Unbeknownst to most of us, Chris Christie has exponentially increased the number of Gulen charters in New Jersey - which will, without a doubt, dramatically increase the price tag as well. But by how much? When he took office, four Gulen affiliated schools existed. Chris Christie has opened three new Gulen charters, and has approved a fourth to open in September, 2017. Simply put, Christie has doubled the number of Gulen charters in his two terms. How much is this costing New Jersey taxpayers in 2017? Thanks to an Open Public Record Act (OPRA) request, I have the State Charter School Aid summaries for every single charter school in the state for FY17, so I can easily calculate that amount. In the 2016-17 school year the taxpayers of New Jersey shelled out $64,972,385 to fund seven Gulen charters. Here are those aid summaries, so you can see the numbers for yourself and you can see if your district is impacted. (There's a zoom feature at the bottom) I think you'll be surprised to see just how many districts are impacted, and how much money they are losing. And as if the loss of almost 65 million dollars is not wild enough, wait until you hear about the expansions Governor Christie's administration has approved for these schools. According to the aid summaries, these seven schools are serving approximately 4,797 students this year. And now to total up all the new seats. You'll notice the 2016 summary from the state doesn't make it easy to see how many seats they've added, so I had to do some digging. 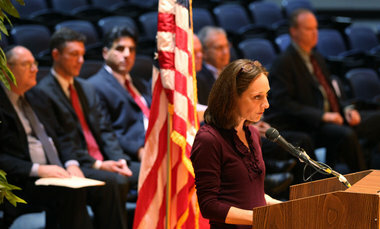 It looks like Bergen A&S was given an increase from 1,040 students to 1,400, a total of 360 new seats. In the letter below, former Commissioner David Hespe says he's limiting TEECS's expansion, citing a lack of diversity, but he still allows TEECS to add an additional 200 seats. Not much of a punishment for not serving the same demographic mix as the sending districts, now is it? Read my good buddy Jersey Jazzman for more on the segregation happening at TEECS. That makes 560 new seats just for Bergen A&S and TEECS, plus another 240 when Union Arts & Sciences opens up in September of 2017 to serve kids in K-2. Union A&S was approved to serve K-5, so at full expansion they will have 480 available seats. Hudson Arts and Science just opened in September of 2016 to serve 360 kids in grades K-5. They were approved to serve K-8, so at full expansion they will serve 540 students, for a total of 180 additional seats. And here's how many new seats were just approved in February of 2017. That's another 2,499 seats in 2017 to add to the 1,220 additional seats for Bergen, Hudson and Union A&S, and TEECS, for a total of 3,719 seats still to come in Gulen charter schools. How much more is that going to cost? According to the Aid Summaries above, there are 4,797 students enrolled in Gulen charters this school year. With a total of $64,972,385 spent, that's an average of $13,544.38 per student. At that per pupil average, Christie's continued reckless expansion of Gulen charter schools will add another $50,371,549 burden to the taxpayers of New Jersey. After Christie leaves office, if the next administration doesn't do something to halt this unprecedented growth, the people of the fine state of New Jersey will soon spend $115,343,934 per year to support a network of Gulen charter schools. And remember - Christie approves 'em but we pay for 'em out of our local tax dollars. If you think this is outrageous, start talking to the candidates for Governor of both parties. Show up at their meetings. Ask them questions. Send them letters. Let them know that if they want your vote they need to halt the charter school growth Christie has unleashed on the people of New Jersey. While you're at it, tell them they need to fix New Jersey's charter school law and give local school boards the say over new charters. And don't forget to tell the gubernatorial candidates that Christie made these decisions as he was about to walk out the door, sticking the next administration with this gigantic mess to figure out. On January 11, 2017 The Health, Education, Labor and Pensions Committee (HELP) will hold the confirmation hearing for Betsy DeVos as Secretary of Education. Recently, Politico released the paperwork DeVos filed with the Committee prior to her hearing. I perused it with some interest, wondering what it might reveal. Not a big surprise that she's involved in numerous education reform organizations, but even I got a chuckle to learn that she's a member of not one, but three yacht clubs. What I really wanted to look at were her political contributions. The unsearchable pdf wasn't user friendly - lists of Committees, Campaigns and PACs are not terribly helpful or illuminating, so I decided to use the Federal Election Commission website to see what I could find. I wanted to see if any of the members of the HELP Committee have any conflicts with DeVos and her billions. Sure enough, a fair number of the Republican Senators do. But before we get to the actual contributions, I need to make something very clear. For Betsy DeVos to disclose only contributions that she gave as an individual is inherently dishonest. I've spent more than my fair share of time researching campaign contributions, and if there is one thing I've learned it's that billionaire families give as a unit. If there is a $2,600 contribution limit, the husband and wife both donate the limit, and they do it as often as possible. The DeVos's are no exception to that rule, and as you will see, if anything, when one member of the DeVos clan contributes, the whole family contributes. Their businesses are family affairs. Just because her first name doesn't appear doesn't mean her interests are not in play. 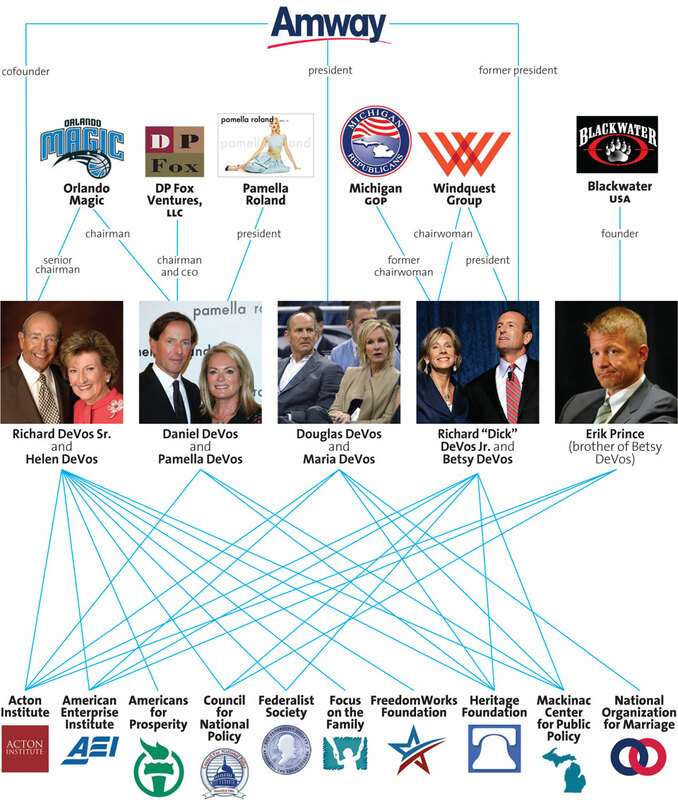 Check back to the DeVos family tree of businesses which illustrates this quite nicely. When we consider if a Senator has a conflict of interest in participating in DeVos's nomination hearings, we have to consider not only her contributions, but those of the rest of her billionaire brood as well. Here is a list of the twelve Republican Senators on the HELP Committee. Let's see how many of them we can connect to campaign contributions or independent expenditures from DeVos, her family and the PACs they have contributed to. Between 1997 and 2016 the DeVos family contributed at least $283,000 to the Alticor PAC. 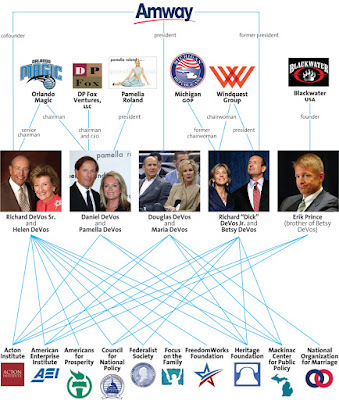 Alticor is the parent company of Amway, and as we all know (see graphic above), Amway is a DeVos family company. Betsy DeVos contributed $5,000 to Alticor in 2015 and another $5,000 in 2016. You can view all of the DeVos family's contributions here. In 2015 Alticor contributed directly to Lamar Alexander's Senate campaign. So right off the bat we've uncovered that the chairman of the HELP Committee and two committee members have benefited from campaign contributions from a DeVos family company PAC. The Senate Leadership Fund describes itself as an "independent Super PAC" and claims that its sole goal is "to protect and expand the Republican Senate Majority when Harry Reid, Elizabeth Warren and their army of left-wing activists try to take it back in 2016." This goal seems to have resonated with the DeVos family - they contributed $2,225,000 between 9/27/16 to 11/1/16. Yes - you saw that right - almost two and a quarter million in a little over a month. You can see those contributions here. According to Open Secrets, Independent Expenditures to support Todd Young in his 2016 Indiana Senate race totaled almost $300,000. Expenditures to oppose his primary challenger Marlin Stutzman totaled $482,330, and to oppose his general election opponent the PAC spent a shocking $11,542,687. That's a total of $12,325,017 to put Young in the Senate. The DeVos Family contributed $2,000,000 to the Freedom Partners Action Fund Super PAC between 2014 and 2016. You can view those contributions here. 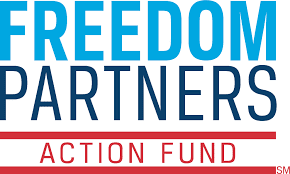 In turn, Freedom Partners Action Fund supported William Cassidy - and they successfully helped him defeat incumbent Mary Landrieu, spending over $1.6M to oppose her. Watch some of the commercials they produced to slam Landrieu - they're pretty heinous attack ads. The expenditures on Cassidy's behalf totaled $223,168 - you can see them here. 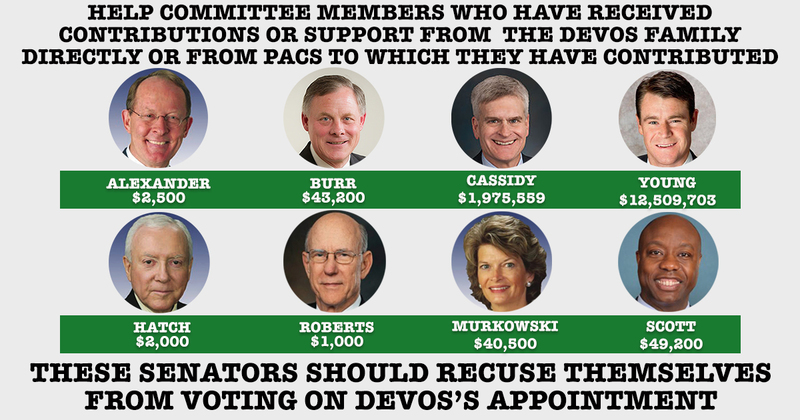 In total, that's almost $2M to put Cassidy in office, and on the HELP Committee where DeVos will have her hearing. Money well spent, I suppose. Freedom Partners spent less to support Pat Roberts, but they supported his Senate campaign to the tune of $17,507.45. See here. ESAFund's website is under construction, but says that they support candidates who "favor enhancing free enterprise, reducing the size of government, and balancing our nation's budget." Between 2014 and 2016 the DeVos family has contributed over $500,000 to the ESAFund. You can see those contributions here. Todd Young's 2016 campaign received $134,086.68 from ESAFund. As a fun aside, ESAFund also spent close to $1M to oppose Bernie Sanders' presidential bid, and Sanders is on the HELP Committee as well. That's a total of $296,800 from the DeVos family ($31,400 in Betsy's name) directly to sitting members of the HELP Committee. This one is just kind of amusing. The Conservative Solutions PAC supported Marco Rubio for President. Betsy DeVos gave $50,000 to this Rubio friendly PAC in her own name, and the DeVos family gave $750,000. See those contributions here. Open Secrets shows that while Conservative Solutions spent almost $40M to support Rubio, they also spent over $4,750,000 to oppose Trump. Can you imagine the kind of leverage this gives someone like Trump over DeVos? Do you think this came up in their meeting? Hard to imagine it didn't, isn't it? So how much money did Senators on the Committee get in total? At the top of this post I listed the 12 Republican members on the HELP Committee, and I have been able to connect 8 of them to DeVos money, either directly or through PACs the DeVos family has contributed to. I would be remiss if I didn't add that this is just what I was able to find combing though FEC filings. In no way are these totals exhaustive. There well could be more money and other PACs I simply wasn't able to uncover with my somewhat limited Nancy Drew style sleuthing abilities. 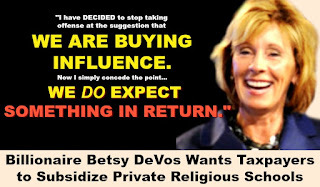 End Citizens United and Every Voice have started a petition asking senators who have received contributions from Betsy DeVosto recuse themselves. You bet I'll be adding my name to that petition, and I hope you'll join me. I would expand that call to include senators who have received the support of DeVos family members and PACs that the DeVos family have contributed to as well. If you haven't yet called your senators and the senators on the HELP Committee to oppose DeVos's appointment, please call on Monday. 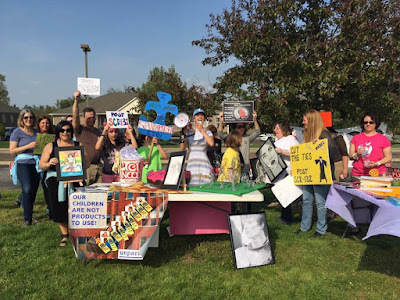 NPE Action has a handy list of Committee Members and their contact information for you to use, as well as a call script. It's crucial we make these calls. 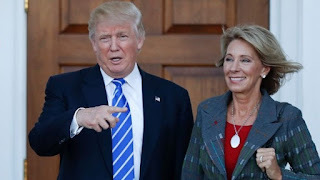 DeVos is on a list of nominees Democrats plan to scrutinize, and Politico has reported that they may demand a roll call vote on her appointment. Hold the senators in your state and the senators on the HELP Committee accountable. DeVos has been clear that the money she and her family contribute is meant to buy influence. "My family is the largest single contributor of soft money to the national Republican party. I have decided, however, to stop taking offense at the suggestion that we are buying influence. Now, I simply concede the point. We expect to foster a conservative governing philosophy consisting of limited government and respect for traditional American virtues. We expect a return on our investment; we expect a good and honest government. Furthermore, we expect the Republican party to use the money to promote these policies, and yes, to win elections." 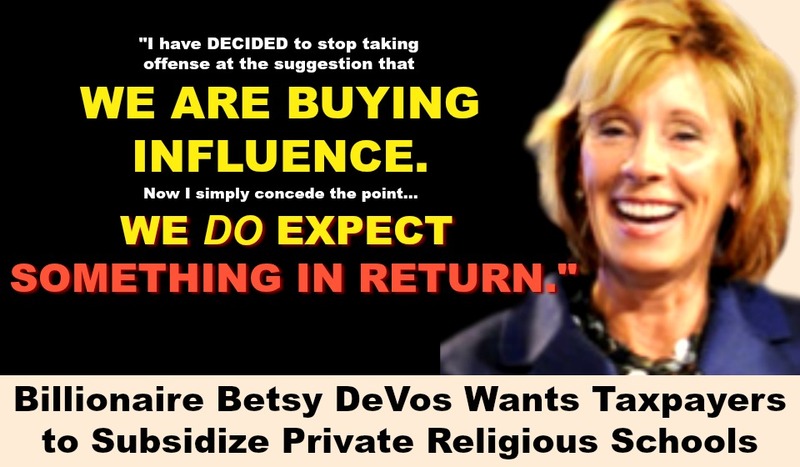 Don't let her buy her way into the Secretary of Education's office. Our public schools are too important, and she doesn't have a clue as to how to oversee them.